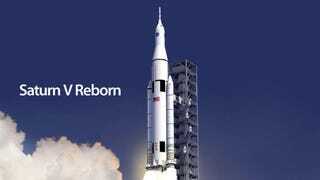 NASA got a new deep space exploration system, the Space Launch System. A new heavy rocket designed to take astronauts well beyond planet Earth's orbit. It's beautiful. It's like the Saturn all over again, but better. The Space Launch System is designed to carry the Orion Multi-Purpose Crew Vehicle and additional cargo to the Moon and other Solar System destinations. This includes "near-Earth asteroids, Mars and beyond." (my oh-my-god-space-swoon emphasis). NASA claims that this new system combines proven elements from the Space Shuttle program and the Constellation program, making it safe and affordable. The new rocket will use the RS-25D/E engine from the Space Shuttle for the mains stage, and the Saturn-derived J-2X engine for the upper stage, running on liquid hydrogen and liquid oxygen. On its side you can see two solid rocket boosters for the initial lift off phase. This power will allow it to carry 70 metric tons at the beginning of its development, but NASA could push it to 130 metric tons in the future thanks to its modular structure, which allows the SLS to use "different core stage, upper stage, and first-stage booster combination" according to the mission requirements.